Utilizing the proprietary Harpin protein technology, EDEN has developed its first product, Messenger®, which simultaneously enhances a plant's own growth systems and natural defense mechanisms to ward off attacks by insects, common diseases and environmental stresses. Messenger exhibits a high degree of environmental safety and, once applied, degrades rapidly and leaves no detectable residue. Messenger has been granted a registration by the Environmental Protection Agency (EPA), allowing for its sale in the United States and is currently registered for use in most states. Enhance plant growth, crop yield and quality. Protect against a broad array of viral, fungal and bacterial diseases, including some for which no effective treatment is currently available. Enhance resistance to attacks by insects, decreasing potential for damage. Effectiveness across a wide array of crops. Reduced risk of environmental damage. Messenger is an ideal product to serve as the foundation of an Integrated Pest Management (IPM) program. When plants are healthy, they are better prepared to resist attacks by diseases, insects and environmental stresses, resulting in a more effective and judicious use of pesticides for enhanced crop protection. In addition, Messenger does not disrupt natural or introduced populations of beneficial predators and parasites that are often an integral component of an IPM program. Messenger can be used throughout the growing season as a tool that not only enhances disease and insect resistance, but also promotes growth and optimal plant health. Messenger has shown an ability to reduce plant damage caused by certain viral, fungal and bacterial diseases. Messenger promotes growth for healthier, hardier plants and has had no direct effect on pests and pathogens. Beneficial insects and microorganisms are not adversely affected. 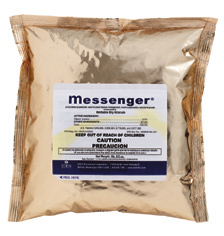 Messenger®, a wettable dry, fine granule, is composed of 3% harpin Ea and 97% food-grade products and other low-risk ingredients. Messenger is effective at low use rates and degrades rapidly in the environment, leaving no detectable residue on plants or in the soil. Once a plant is treated, activation is generally initiated within 5 to 10 minutes and full response occurs within 3 to 5 days. Resulting effects may continue for several weeks or throughout the growing season, depending on the crop.